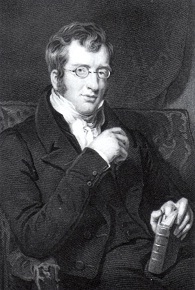 Thomas Fowell Buxton was MP for Weymouth between 1818 and 1837 and led the struggle to abolish slavery as an economic system. The trade in slaves had been abolished by Parliament earlier in 1807. But slavery still persisted as an institution. Children continued to be born into slavery on plantations in the British Empire. Thomas Fowell Buxton took over the leadership of the movement in parliament from William Wilberforce in 1821. In 1833 after a long campaign in which he was subjected to virulence, lampooning and attempts at character assassination, he succeeded in having Parliament pass an Act for the liberation of slaves. At the stroke of midnight on 1st August 1834, 800,000 slaves ceased to be property, no longer to be bought and sold at market like cattle, no longer subject to arbitrary and often very cruel punishments, and with no standing in law. They became citizens, able to own property, maintain their marriages and families and their children became their own. Thomas Fowell Buxton, although a hero in many parts of the world is almost unknown in Weymouth today. 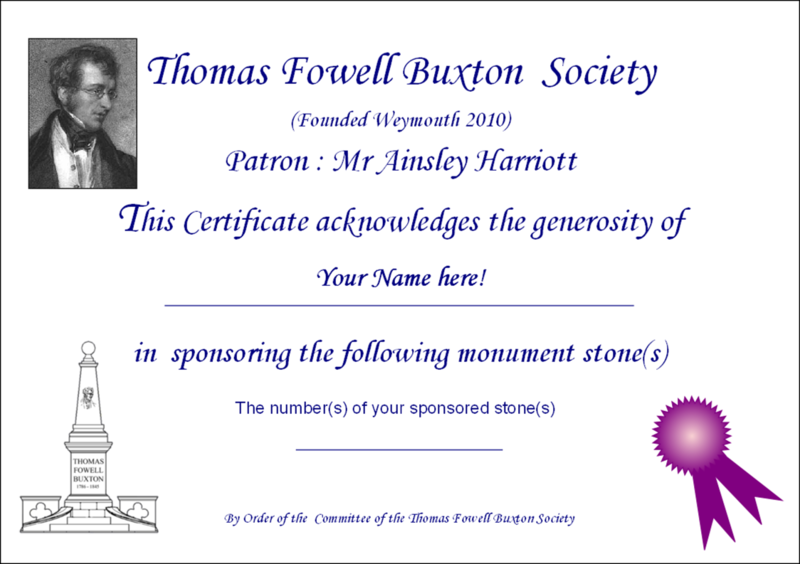 Please help to commemorate Thomas Fowell Buxton’s achievement by making a contribution to the Thomas Fowell Buxton Monument, which is to be built on a prominent site in Weymouth. It will be a fitting memorial to Weymouth’s most illustrious MP, who finally put an end to a disgraceful episode in British history. Since 2010 the students of Weymouth College’s stone carving department have been carving the 144 stones that together make up the monument. 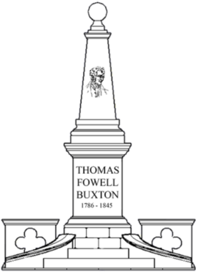 The design of the monument was drawn up by a student, Mr Peter Loizou and the details on the monument represent achievements in Thomas Fowell Buxton’s life. The stones have now been carved and the monument is ready to be built. We have the stones; we have a site. But we need the money to erect the monument. We are seeking to raise between £25,000 and £30,000 over the next year. We shall seek grants from trust organisations where our project is relevant to their aims, but we compete in a very crowded place. The Thomas Fowell Buxton Society was formed as a result of public interest and it is hoped that local businesses and members of the public will continue to demonstrate their interest by donations. All donations will be recorded in a Tribute Book which will be held in perpetuity by the local Council. Donors will be given the opportunity of posting something about themselves or their organisations in the Tribute book. The names of donors will also be posted on our website (with permission of the donors). Donations can be gift aided and by this means the Society can gain a tax rebate of the basic rate of tax (currently 20%). There are 144 stones which make up the monument. They range from the simplest (paving stones) to more complex stones which embody detailed carvings. Sponsorship prices range from £20 to £500 depending on the complexity. The names of sponsors will also be recorded in the Tribute Book. The names of all donors will be entered into the Tribute Book which will be kept in Weymouth. Every time the page is loaded or refreshed the sponsor’s adverts are listed in a different order. So your company will have an equal chance of appearing at the top of the list. Download the donation form from here. Download the sponsorship summary sheet from here. This shows the stones available for sponsorship. It is updated regularly. Choose a stone - if appropriate and/or make a donation. Contact the webmaster attaching your company logo. We will send back to you a certificate for your donation or sponsorship and your logo will be added to the list on our website.